One of Pappaw's favorite passages of scripture was Romans 8 and subsequently is becoming very special to me. In honor of him I wanted to post one of my favorite sections. 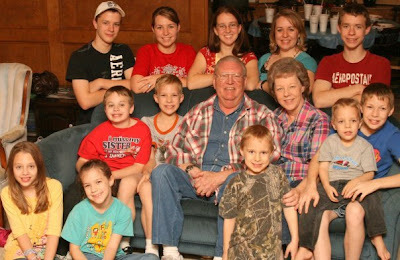 The picture below is the last one we had of all the grandkids and Mamma & Pappaw (taken at Christmas 2008). Early on Saturday morning, December 26th, 2009, God lifted the burden of pain and suffering and welcomed Donard into his loving presence. While we miss him intensely, it is comforting to know he is worshipping the Savior with family and friends who have gone before. Each one of us who have trusted Christ as Lord and Savior can look forward to being reunited again one day with Donard for eternity in our heavenly home. We are forever grateful for every expression of love throughout Donard’s illness and especially for your faithful prayers for Donard and now for the family. The other day at Mardel's I found some of the True Love Waits rings and realized that it was exactly what I've been looking for without even knowing I was looking! I had heard of the idea in the past and seen pictures of the rings but it never really occurred to me to get one. More recently though I'd been wanting a symbol to remind myself of my faith that God has me exactly where He wants me. The traditional meaning of the phrase has been centered around moral purity but for me personally it was much more than that. It's also about waiting for that perfect one God has for me and not just the first nice Christian guy that comes along. But as I thought of this I thought of other applications in the lives of friends and family members. What if you found your true love...but it has been lost along the way and you must wait for God to bring it back? This is also not an easy thing to wait for and many along the way encourage you to give it up. But true love waits. Waiting seems to be a constant classroom God has me in. I guess I haven't learned patience yet because it seems every time I turn around He's telling me to wait for something. Waiting for people, waiting for answers... Do you know how many times the theme of waiting on God is in the Bible? I think of Joseph and how much of his life he was waiting on God--in the pit his brothers threw him, in slavery to Potifar, in prison. I think of Abraham waiting for God's promised son, Jacob waiting for Rachel, David waiting to be king...and many others. Over and over again people waiting for God to work in impossible situations that sometimes they tried to change on their own and failed. But you know what? God makes beautiful promises for those who do wait on Him. Isaiah 40:31 says "But they that wait upon the LORD shall renew their strength; they shall mount up with wings as eagles; they shall run, and not be weary; and they shall walk, and not faint." Isaiah 30:18 tells us "blessed are all they that wait for Him." So I wait, and wait, and wait some more. And I look at this ring and I don't just think of the one out there somewhere I'm waiting for but I think of others I know who are waiting in various ways. I think of how God waits for each of us to receive the gift of Love He gave us on Christmas. I think of waiting for Christ to return for His bride. I think my new favorite verse is Psalm 130:5--"I wait for the LORD, my soul doth wait, and in His Word do I hope." Instead of looking at my ring as waiting for someone, I am waiting for the Lord to do great and marvelous things for me and for the ones I love. There's a song that has been especially meaningful to me lately in regards to waiting. It's called "Time In Between" by Francesca Battistelli. Donard’s pain was mostly under control shortly after Thanksgiving for a couple weeks but now appears to be stepping up another notch. While sleep has consumed about 18+ hours daily, he has been able to wake up for short periods during the day and for about 4 hours every evening to have supper and visit with us. This pattern will be interrupted for a week or so while his body adjusts to additional medication to meet the new pain level. Specific answers to prayer have been encouraging: Breathing treatments have proven to be helpful, and swallowing difficulties have lessened some, at least temporarily. God’s intervention in these areas definitely lowered our stress levels, for which we are especially grateful. Thank you for your many expressions of love and especially for your continued prayers for Donard and the family. Our prayer is that you will have a very blessed Christmas and New Year and that each of us will know and trust Jesus more every day. He alone is the reason for the season. It seems like it's been a long time since I blogged anything significant other than Pappaw reports. It certainly isn't because nothing has happened! It's more likely just that I've been so very busy. At the end of August I became a nanny to Kennedy (5) and Garrison (3). They are great kids and I've really enjoyed being paid to have fun with them! We've had our ups and downs getting to know each other but I think we are finally becoming friends. Garrison who hasn't really reciprocated my hugs not only gave me one on my last day before Christmas vacation but even gave me a big kiss (unprompted!). :) It makes me feel all warm and fuzzy inside!! Between all of my jobs (Bazaarvoice & nannying mostly) I'm now working 40-50 hours a week which is definitely a culture shock for a homeschooler who has worked almost exclusively from home the last two years. Yikes! The first couple of weeks were very hard as I adjusted to the new schedule which included leaving my house at 7 AM four days a week and not getting home until 7 PM most nights. I finally settled into somewhat of a routine but it's definitely been a challenge. The other big change has been Pappaw becoming bedridden. He has a hospital bed in the livingroom and enjoys visitors when possible. We've tried to spend some time over there but with our ever increasing busyness it has been hard to carve out time for anything extra. I unfortunately fail at being a good granddaughter these days and visiting all my ill grandparents regularly. Some wonderful friends helped come and sing for him one night and despite being heavily medicated that night I think he did enjoy it. We hope to do it again very soon. Really though the biggest struggle for me lately has been the really overwhelming mountain of things that scream for my attention and the complete feeling of helplessness in keeping up with it all. It seems like the harder I try the further behind I get. Time management was not my strong suit in the past and now that it is non-optional I've found myself very easily discouraged. A week ago was especially bad because Joanna was very late getting home which put me even later getting to my home and for nearly a week all I had time for was to bring my things in from the car and grab some dinner before devotions and bedtime were upon me. I am learning a little bit at a time to do little things that help me keep from falling so desperately behind...simple things like every time I'm in the bathroom choosing one type of thing to do like gather all the toothbrushes and put them away or pick up the dirty towels. Unfortunately there was no hope at all for my bedroom which was drowning me in unfiled papers and baskets of laundry. This extra long holiday vacation is being super helpful for catching up on those things though and hopefully I will be able to maintain it to a point that I won't fall so far behind. It really just has been a nonstop stream of activity since I started working and my room was already a nightmare. I do not know how moms with full time careers besides their kids do it!! One thing I've noticed about being so busy is that time seems to really go by quickly. I feel like I have that watch from the story and that I'm somehow speeding up time because every time I think about it the time seems to just go by faster. I can hardly believe Christmas is already here. As I put up the lights up outside and shivered in the very definitely wintry weather it seemed almost unreal. I'm not finding the Christmas "mood" coming very easily this year, I just feel almost indifferent. I want to be in the Christmas mood but somehow it eludes me. Every time I try to play my Christmas music in the car or as I work it just doesn't feel right and I switch back to my normal stuff. I've been Christmas shopping and bought some gifts I'm super excited about giving and yet it still doesn't feel like Christmas. It feels as if Christmas will just fly right by and I won't have even had the chance to enjoy it at all. Well one thing I will say about my new schedule is that I finally do want to go to bed at decent hours again!! My body tells me it's after 11 PM despite the fact I haven't had to get up early this week. I think the chiropractor said that's a good thing, 10 PM - 6 AM is when we get the best sleep. I'd prefer that number to end up a bit closer to 8 or 9 AM myself. ;) And now that I have an entire book typed up I believe I can post this and feel accomplished. Writing is something I do miss at times and this seems to be my only outlet for it. Increasing pain has necessitated stronger meds and, as a result, increased sleep. Breathing problems and difficulty swallowing have recently compounded significantly. Please continue to pray for God's presence to be evident, for strength to finish the course, and for His perfect peace.